Assuming you’ve been using Adobe InDesign CS4 ( ) for a while now, you may have noticed that Adobe removed the Navigator panel. The Navigator panel (similar to the same tool in Adobe Photoshop) allowed you to view a small thumbnail of your document which you could click on to zoom to specific places in your document. The Navigator panel was handy, but flawed for more than a few reasons—not the least of which was that it slowed down your InDesign using experience because it had to redraw the icon in the panel every time you changed the view of your page or added objects to your document. While I hate to see any feature removed from an app, especially a mission-critical app for designers such as InDesign, Adobe has done the right thing by replacing the Navigator panel with a more useful and intuitive way to navigate your documents called Power Zoom. Power Zoom allows you to scroll and zoom through your documents using the Hand tool quickly and easily. The best part is, it doesn’t require you to clutter your screen with yet another open panel in order to use it. Here’s how it works. With your document open (preferably a multi-page document since using the tool on a single-page document is kind of overkill), activate the Hand tool. You can either click the Hand tool icon in the Tools panel, hit the H key if you have another tool selected, or if you have the Text tool active and are currently editing text, hold down the Option key. With the Hand tool active, hold down your mouse button. Your document will zoom out, offering you a full view of where you’re at on the current page. A red box indicates the view area of your page or spread. Still holding down your mouse button, you can drag the red box around your document pages to anywhere you wish to scroll to. When you release the mouse button, the document will scroll to the page you moved the box to, and zoom back to your original view percentage. If you want to scroll and zoom to a specific area on another page, such as a small text block for instance, move the red box to the page you want, then use the arrow keys to shrink or grow the red box to a specific area. You can use either up and down or left and right arrow keys to do this—it doesn’t really matter which. 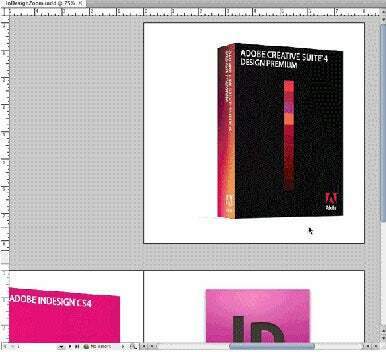 When you release the mouse button, not only will InDesign scroll to the page you have the red box on, but it will also zoom in or out to the size of the red box after you’ve adjusted it with the arrow keys. You can see the Power Zoom tool in action in the animated screen capture to the right. Of course, if you simply want to go to a specific page number in your document, you can simply hit Command-J, type the page number your want to jump to, then hit Return. This will take you to that page, keeping the zoom level the same. This feature, which has been around as long as I can remember, is useful if you know exactly which page you need to jump to.